I love it when you share my recipes! Please use this image for Pinterest. Thanks! I’m sorry I haven’t been able to share very many recipes with you all lately! Summer has been busy and full of great stuff (and will continue to be busy for a few more weeks)! This week Jim and I both helped out with VBS at church…it was a great week, and we had fun with hundreds of kids, playing and telling them how much God loves them! 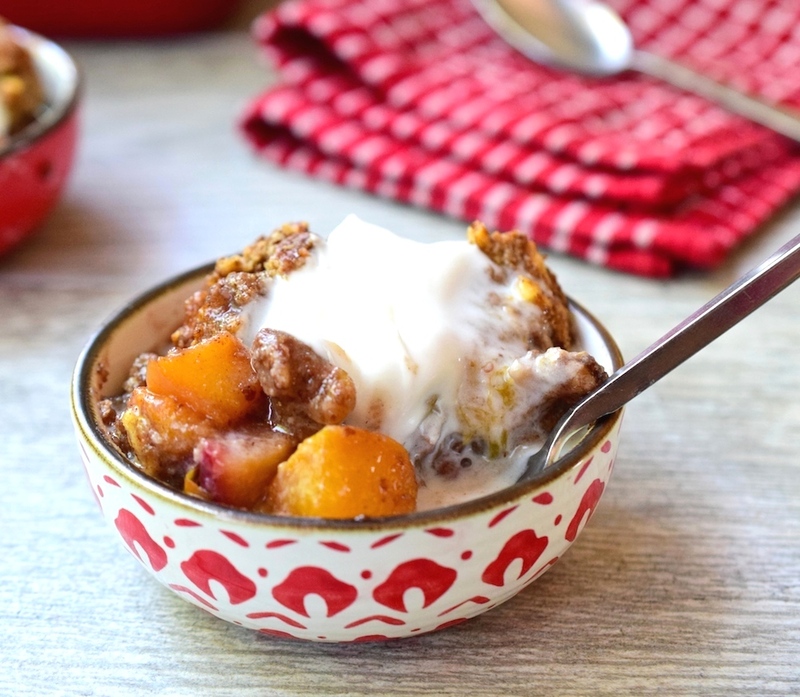 I’m pretty worn out, but wanted to share this recipe for Paleo Peach Crisp with you all. Last weekend I served it to some friends who are having a hard time, and it proved to be a very effective comfort food. I almost never make a peach crisp that uses only peaches for fruit. The flavor of peaches is enhanced nicely by something more tart, so I included plums in this recipe, and I have to say that it really turned out perfectly! The flavors of peach, plum, and maple syrup came together to make a beautiful symphony of flavor that did a little happy dance in our mouths. 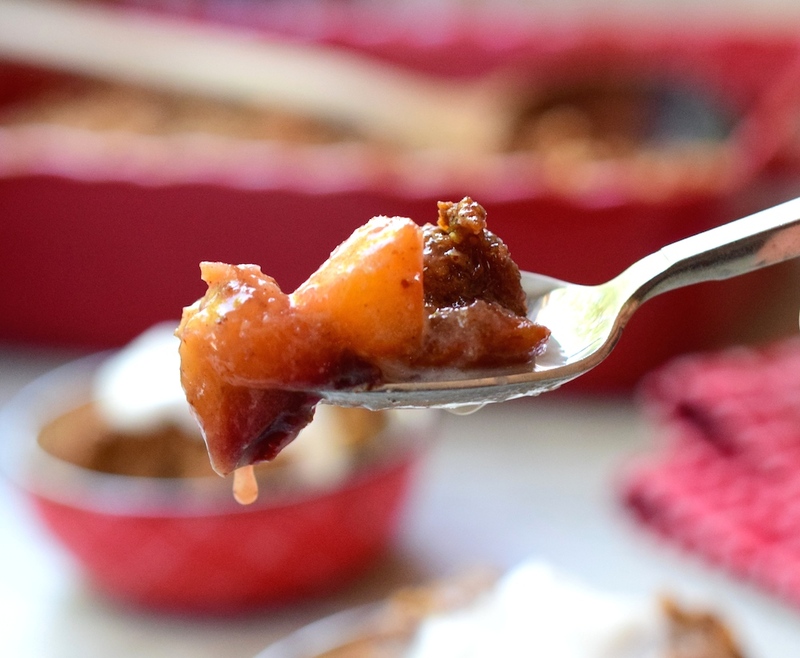 Not only does this Paleo Peach Crisp taste good, it is also good for you. The orange color of those peaches means that they have Vitamin A in them. I’ve told you before that Vitamin A is actually made more bioavailable by cooking it. One of my tricks for maintaining the healthiness of this dish is to leave the skin on the fruit. It adds fiber and I actually like to texture of it. You may be worried that you or your guests will get a bite full of skin, and it will be less than desirable! The key is to cut up your fruit into bite sized chunks, so that each bite is easy to chew. There is definitely some sugar in this recipe from the fruit and maple syrup, so eat it in moderation, especially if you have diabetes. Before we get to the recipe for the Paleo Peach Crisp, I want to invite you to join with others who are making healthy changes. I’d love to walk alongside you in your journey towards wholeness and health! Jesus said, “I have come that they may have life, and have it to the full!” Freedom from food addictions is part of having a truly full life. 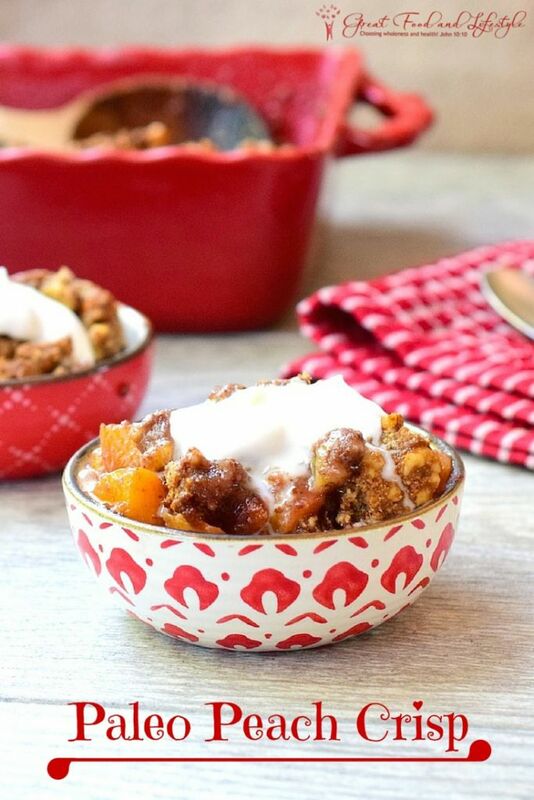 This Paleo Peach Crisp is the perfect healthy comfort food for summertime! It's vegan and bursting with flavors! First prepare your crumble topping. I mixed mine together the day before, then refrigerated it overnight. For the recipe, click on the link in the ingredients above. When you are ready to bake your crisp heat the oven to 375 degrees F and spray a large baking dish with coconut oil. Wash the fruit, pit it, then cut it into bite sized chunks and place it in a large bowl. Leave the skin on for added fiber. Add the remaining ingredients (except for the crumble topping) into your bowl and stir well. If you'd like to make it thicken while baking, add a couple of tablespoons of potato or tapioca starch. Pour the fruit into your prepared dish, then use your fingers to evenly distribute the crumble on top. Bake the crumble, until the top is turning a slightly darker brown, and the filling is bubbling. It should take about 40-50 minutes, but check it at 35, just in case. Remove it from the oven and let cool for a few minutes before serving. You can serve this dish warm or cold. I garnished mine with coconut cream. Enjoy! 3 Responses to "Paleo Peach Crisp"